Bollywood hottie Mallika Sherawat continues to take Hollywood by storm! Recently she was hanging out with rock stars at the famed Sunset Strip music venue The House of Blues. As a special guest of Donovan Leitch (son of legendary musician Donovan) at his Camp Freddy gig, Mallika met and hobnobbed with Ace Frehely of the band KISS, Duff McKagan of GUNS n ROSES, Dave Navarro of JANES ADDICTION, Billy Duffy of THE CULT and Ozzy Ozbourne. Accompanied by her Los Angeles entourage, Mallika hung out backstage before the show, and then enjoyed her very first rock concert down front of the stage for the full experience. She "tweeted" throughout the night on her Twitter social networking account, saying to her followers "OMG! Ozzy's on right now! I have no eardrums left!" 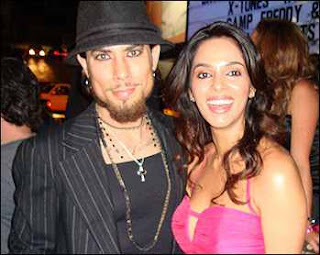 and that notorious rake of rock Dave Navarro was "very charming and a perfect gentlemen." When asked what she thought of the concert, she replied "She had great fun. Donovan was the perfect host. For my first rock concert, it couldn't have been better!"